Adoption of artificial intelligence is crucial to staying ahead of retail disruption. With leading retailers shifting their focus onto AI and analytics, it's clear that data is becoming a driving force in retail transformation. So much so that Gartner believes "by 2018, retailers engaged in IoT partnerships with major manufacturers will take significant market share from competitors due to direct connections with consumer lives1." Armed with this information, you'll have everything you need to get ahead, and stay ahead, of disruption as you prepare for the future of retail. All statements in this report attributable to Gartner represent Intel interpretation of data, research opinion or viewpoints published as part of a syndicated subscription service by Gartner, Inc., and have not been reviewed by Gartner. 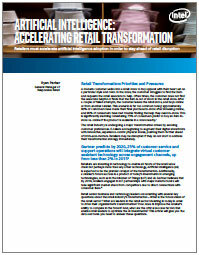 Each Gartner publication speaks as of its original publication date (and not as of the date of this Artificial Intelligence: Accelerating Retail Transformation. The opinions expressed in Gartner publications are not representations of fact, and are subject to change without notice.